Palit Microsystems, mostly known for its custom graphics cards, has just announced two new SSD product lines. The Palit UV-S series uses the low cost triple level cell (TLC) NAND flash, while the GF-S series is “designed to perform for the gamers,” and uses multi-level cell (MLC), offering better performance overall. There are seven models available across the two lines. 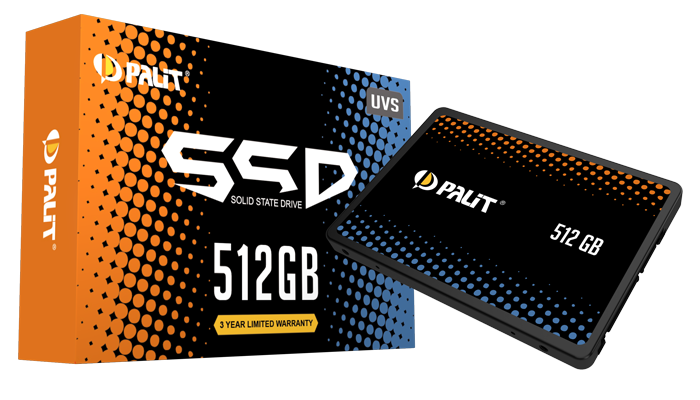 Palit is generally known for offering cheaper alternatives in its graphics cards, and the same looks to be true with the SSDs, as the highest capacity you’ll find off the bat is 512GB, and they all have a SATA III 6 Gb/s interface with the standard 2.5 inch form factor. In the UV-S Series, the lowest capacity 120GB model uses standard TLC flash memory, while the higher capacities use 3D TLC with its vertical stacking and improved performance. The 120GB model has a max sequential read speed at 560 MB/s, but a lower sequential write speed of 375 MB/s. You’ll find 560 / 470 MB/s on the 256GB version, and 525 / 465 MB/s on the 480GB and 512GB models. All of Palit’s SSDs will come with a three year warranty. There’s no information currently on pricing or availability, but you can expect the GF-S Series to be slightly more expensive than their UV-S equivalents. We’ll be looking for some higher storage capacities in the future for this so-called gamer line, as you’ll fill up a 240GB drive pretty quick with modern games. While we wait for more information on these drives, you can check out PC Gamer’s guide to the best SSDs on the market.